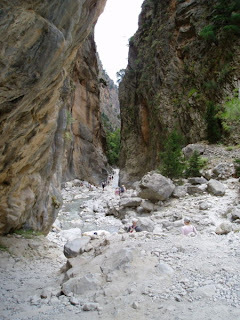 The Samariá Gorge is a national park in the island of Crete, one of the major tourist attractions of the island. 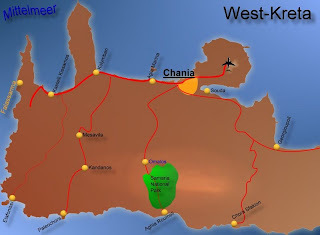 The gorge is in the prefecture of Chania in the South West of Crete. It was created by a small river running between the White Mountains (Lefká Óri) and Mount Volakias. There are a number of other gorges in the White Mountains. Some people say that the gorge is 18 km long but this distance refers to the distance between the settlement of Omalos on the northern side of the plateau and the village of Agia Roumeli. 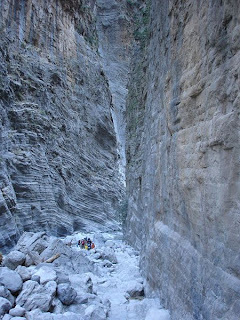 In fact, the gorge is 16km long, starting at an altitude of 1250m, at the northern entrance, and taking you all the way down to the shores of the Libyan sea in Agia Roumeli. 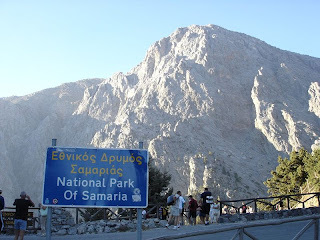 The walk through the National Park of Samaria is 13 km but you will have to walk the extra 3 km to Agia Roumeli from the exit of the National Park making it 16 km. The most famous part of the gorge is the section known as the 'Iron Gates', where the sides of the gorge close to about 4 meters in and reach up to 500 meters high. The gorge became a national park in 1962, particularly as a refuge for the rare Kri-kri (Cretan goat), which is largely restricted to the park and a small island just off the shore of Agia Marina. There are several other endemic species in the gorge and surrounding area, as well as many other species of flower, bird, etc. The village of Samariá lies just inside the gorge. It was finally abandoned by the last remaining inhabitants in 1962 to make way for the park. The village and the gorge take their name from the village's ancient church Óssia María (St Mary).